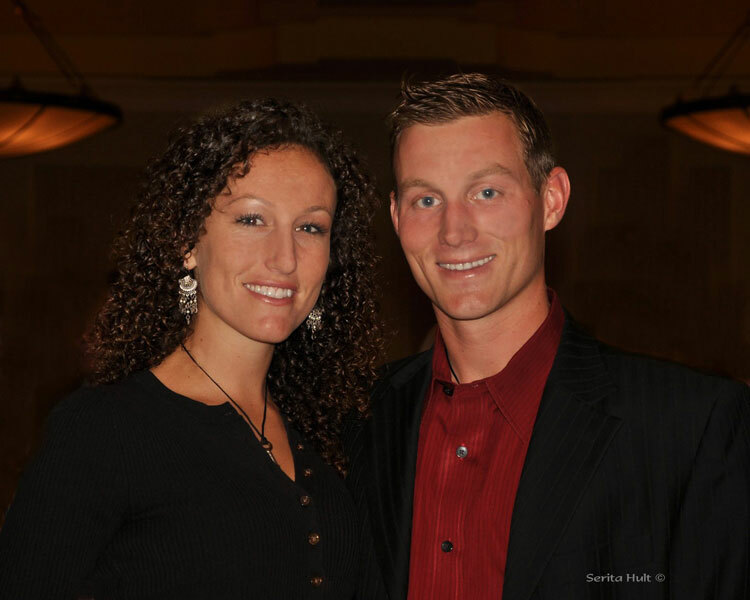 Ali and Brandon made their first investments together as a newly formed team in the fall of 2009. They scraped up $12,000 to purchase two pin-hook prospects with plans of offering them at the 2010 April OBS juvenile sale. That spring, their Limehouse colt (Humble and Hungry), that they bought for $7,000 in October, breezed in 20 4/5 seconds and went on to sell to Bob Feld agent on behalf of Sagamore Farm for $200,000. Their filly by During breezed in 10 1/5 seconds and sold for $12,000 to Thor-bred Stables LLC. 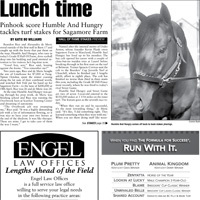 Humble and Hungry not only gave the couple a beautiful debut consignment, but has also run on to be a sound, competitive winner and graded stakes placer. He made his debut in the 2010 Breeders’ Cup Juvenile Turf finishing 3 ½ lengths behind Pluck. More recently, he won the G3 Commonwealth Turf and finished second in the G2 Dixie Steaks at Pimlico. 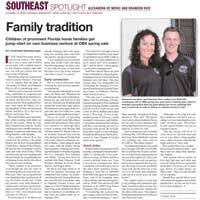 The couple brought their talents, resumes, and contacts into their second season together and were able to purchase five pin-hook prospects for themselves, and have two new clients entrust their Thoroughbred investments with them for the 2011 season. Leasing the southern division of Woodside Ranch to accommodate their young business, they were able to train another session topping graduate who sold for $275,000 in the 2011 OBS April Juvenile sale. The War Front – Tappin For Gold filly breezed in 10 1/5 seconds, galloped out very well, looked fantastic on a shank and managed to more than triple their client’s initial investment. Ali and Brandon couldn’t be happier with their results for the first five seasons, but most importantly they are thrilled to have each other as teammates in life. As they enter their sixth season, they’re filled with excitement for who might be the next big horse in their barn, and for whom might entrust them to start and train their Thoroughbred investments. The couple will be shopping the upcoming yearling sales and looking for more investment opportunities together. They are ready to accept more horses into their program and understand that it takes time and considerable effort to build working relationships and have people offer them opportunities to grow. Brandon Rice is a third generation horseman who was raised in Ocala, Florida on his parent’s pin-hooking and pre-training operation, Woodside Ranch. Brandon’s parents, Bryan and Holley Rice, have become well respected for developing two-year-old sale prospects and winners for their clients, and have demonstrated over the past thirty years their sharp eye for talented horses purchased at a value. Brandon’s pedigree will also make note of his grandparents Clyde and Jean Rice, his aunt Linda Rice who continues to lead the rankings of New York trainers, his uncle Todd Beattie based out of Penn National recently known for campaigning Fabulous Strike, Frannie and Jesse Campitelli out of Maryland, and several other family ties in the business too numerous to mention. To move past his pedigree as Brandon would politely encourage us to do; he would rather highlight his studies and accomplishments. Life atop Thoroughbreds started at the eager age of 10, galloping horses at Woodside during the summers and before the school bus would arrive. With his parents ever invested in yearling and two-year-old sale prospects, his passion for helping to present, sell, and even invest in the young horses grew. Learning to ride, groom, shoe horses, and manage a farm were all part of the “Rice” childhood degree. Brandon attained his Bachelor degree in Finance at Florida State University in 2006. He filled his University years providing riding lessons, farrier services, and breaking horses for the local Tallahassee horse community. During his summers he worked at Saratoga as an exercise rider and foreman for D. Wayne Lukas. Immediately following his four years at Florida State, he was accepted into HH Sheikh Mohammed bin Rashid Al Maktoum’s Darley Flying Start Thoroughbred management program. This two-year program allowed him to study with industry professionals in Ireland, England, USA, Australia, New Zealand, and Dubai. His studies ranged from veterinary and nutrition courses at Universities, to breeding, foaling, and sales prep work on multiple stud farms, and hundreds of lectures covering nearly every topic in international horse racing. Possibly the most applicable lessons learned in his international studies came from working within the training stables of Todd Pletcher, Mark Johnston, Mike de Kock, Doug Watson, and Roger James. Upon graduation from Darley Flying Start in the summer of 2008, he returned home to Ocala, Florida to make his start. His first season working for his father at Woodside Ranch, he had the privilege of breaking horses such as Dublin, Conveyance, Acting Happy, Golden Itiz, and Vision in Gold among other top graduates. This first season home more notably sparked his relationship with current wife, then fiancée, Alexandra de Meric. “Ali was still finishing college in Tampa”, Brandon recalls with a smile. Brandon continued, “As I like to tell the story; in business school we learn that joining forces with competition is often a superior strategy rather than battling to overtake your competition.” So that’s exactly what they did in the spring of 2010. Alexandra de Meric, known to most as “Ali”, is a second-generation horsewoman. 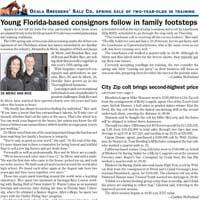 Her parents Nick and Jaqui de Meric have made a living buying, training and selling Thoroughbreds for the past 30 years based on their farm in Ocala, Florida. Ali has worked extensively in thoroughbred sales, traveling around the world helping consignors sell at public auction. She is now turning her attention to her own operation with her husband, Brandon. 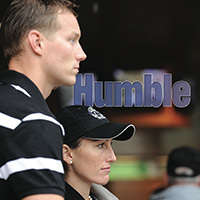 The two are a dynamic duo whose life revolves around the horses they purchase, care for, and train. Ali grew up in Ocala along with her younger brother Tristan, learning the business by hands on participation from a tender age. Riding was always Ali’s favorite part of the farm routine, and it wasn’t long before she began starting young horses in the round pen under her parent’s tutelage. She began galloping during school breaks and summers, having the opportunity to learn and ride from her parents and their team. “When I was small, I used to love to attend the sales and ride the pony behind my dad as we went to and from the track”, she recalls. Riding the two-year-olds on the farm, racetrack and at the sales was the natural progression to her journey of self-employment. For the past decade Ali has worked for a variety of thoroughbred sales agents, including but not limited to, Pat Costello at Paramount Sales, Francis and Barbera Vanlagendonk of Summerfield sales, Ted Voute, Dr. Masataki Iida of Chiyoda farm, Threave Main Stud, and Arthur Hancock at Stone farm. Traveling around the United States and worldwide to England, Ireland, France, Australia, New Zealand, Japan, and South Korea, Ali has gained wide respect for her starting, training and riding techniques with young horses. In 2007, Ali was recruited to be part of the Korean Racing Association’s purchase of sixty horses from the OBS April two year old sale. She then managed the quarantine of those horses and oversaw their safe departure to Korea. Ali later attended college at the University of Tampa and graduated with a bachelor’s degree in Business Management. After graduating, she moved in with Brandon at Woodside Ranch and began working for Bryan and Holley Rice starting and riding young horses. Ali and Brandon have been training under their banner, RiceHorse Stables, for the past 5 years and are currently training horses headed to the two-year-old sales and those going straight to the race track.